When a couple divorces in Nevada, all community property should be divided equally, as Nevada is a community property state. This does include instruments like retirement accounts and insurance policies, or at least the portion that was paid in during the marriage. However, such accounts cannot simply be divided by handing a lump sum to the other person. A document called a Qualified Domestic Relations Order (QDRO) empowers the relevant authorities to divide your retirement accounts in the appropriate ways, but it must be executed correctly. Normally, when you create a 401(k) or money purchase plan through your employer, its proceeds can only be disbursed to one specified payee. That person will receive the proceeds when the plan allows for disbursement. If your retirement account was created prior to your marriage, it is important to keep in mind that the portion you contributed during your single period is your sole property, and thus not divisible by the court. Only the money paid in while you were married is community property. Because most retirement accounts are controlled by private plan administrators, they cannot simply be divided. The QDRO is a document which allows the plan administrator to disburse a portion of the account’s funds to an alternate payee – usually the ex-spouse of the account holder – while still preserving the privacy rights of the plan’s other participants. Indeed, the existence of a valid QDRO creates the right of the alternate payee to receive a portion of the account holder’s benefits. Generally, it is suggested to have any necessary QDRO drawn up by a licensed attorney, rather than attempting to create one on one’s own like many do with wills or contracts. The reason is that there are extremely specific requirements for what a QDRO must contain, and what it must not contain, and if errors are made, you run the risk of your QDRO being rejected. 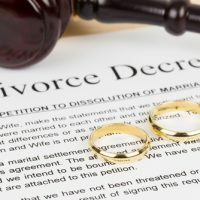 It is important to note that although a QDRO generally results from a family-related support obligation or a legal separation (or marital dissolution), it does not necessarily have to be authored at the time of your divorce. It must create an alternate payee for some instrument related to retirement, but there is no specific language in the law that requires a QDRO to have to come on the heels of a divorce. Divorce or separation are merely the most common occurrences during which couples may realize they need one. Nevada domestic relations law is complex, and QDROs can be among the most difficult documents to read and understand. You need an attorney who is experienced in such matters, and is willing to go the extra mile to ensure all is as it should be. The Las Vegas asset division attorneys at the Kainen Law Group are happy to help answer your questions and do their best to get you through. Call the office today to set up an initial appointment.